The state of Texas is home to at least 15 dangerous snake species. Some of the most venomous are the cottonmouth, the copperhead, the Western rattlesnake, the timber rattlesnake, the blacktail rattlesnake, the Western diamondback rattlesnake, the Massagauga pygmy rattlesnake, and the harlequin coral snake. 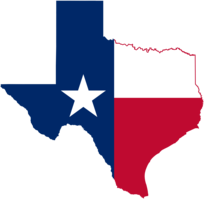 However, in Texas you can also come across some non-venomous snakes that look similar to their venomous relatives; some of them even emit a rattling sound. For example, the venomous coral snake and the milk snake look remarkably alike. Snakes have a critical role to play in the ecosystem, and not all snakes are harmful to humans. However, pit vipers, who get their name because they have a pit close to each nostril that allows them to sense the body heat of warm-blooded victims, are venomous. There are actually over 150 pit viper species around the world, with even more subspecies and varieties. Texas coral snakes, on the other hand, are not pit vipers but Elapids, like the cobra. The Western or Texas diamondback rattlesnake (Crotalus atrox) is the largest pit viper with the capacity to grow to over eight feet in the right conditions. You’ll find this snake all over Texas except for the east and the northern panhandle, and especially in areas of thick brush or vegetation, usually opting for dry areas rather than wetlands. It is a very heavy snake, and it is the second cause of deaths due to snakebite in the country after its Eastern cousin. Its brownish “base” with cream outlines around the classic diamond shape and a quick to respond rattle announce its presence. The Western diamondback has a massive range, extending well into Mexico and stretching from the Southeast to California and approximately halfway to Canada. Although the venom is somewhat less toxic than some other rattlesnakes, it makes up for it by producing immense quantities, as much as 800 mg can be delivered in a full envenomation. The venom causes severe muscle deterioration as well as massive internal bleeding. As with the Eastern diamondback, fatality rates are estimated at 20%. The Western diamondback only trails its Eastern cousin (slightly) in U.S. annual fatalities and would certainly be the leading killer if its habitat were less sparsely settled by humans. The Western diamondback is easily the snake most responsible for venomous snakebite deaths in Mexico. Copperhead snakes (Agkistrodon contortrix) are brown, tan or rust-colored with lighter gray, brown or copper bands and patches. They are easily camouflaged by the leaf covered forest ground, and as a result they are dangerous to accidentally come across. The copperhead is a member of the pit viper family, like most of the venomous snakes in North America. Its primary range is along the Eastern Seaboard as far north as New York and inland as far west as Nebraska. Just like the coral snake, the copperhead has been copied by other non-dangerous species of snake such as the northern water snake. A moderately-sized snake, most copperheads are less than 36 inches with larger specimens reaching 48 inches. The snake is fairly stout with weights from 1/2 to 3/4 of a pound. The venom of copperheads is weaker than that of other pit adders. It is considered to be non-aggressive, and when excited/threatened, the copperhead will often assume a “freeze” strategy and rely on its excellent camouflage (ironically, making it easier for unwary humans to step on it, provoking a bite). 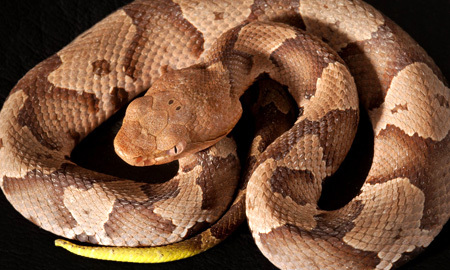 All pit vipers are capable of delivering a bite with little or no venom delivered, but the copperhead is unique in that most defensive first strikes include no venom. If the snake is still being threatened, a second strike almost always does include venom. The Texas coral snake (Micrurus tener) has brightly colored markings that can easily be confused to that of non-venomous species, who have developed them to look more threatening to potential predators and ward them off. 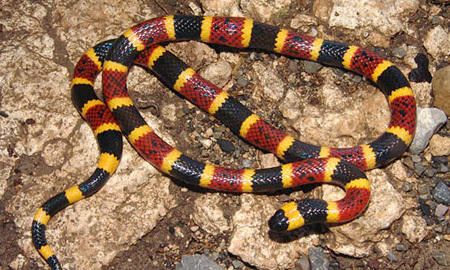 If the yellow and red bands touch - not red and black - you are facing a venomous coral snake. This rhyme might help you to remember: “Red and yellow, can kill a fellow; Red and black, a friend of Jack” This essentially means when red and yellow are together in the pattern, the snake is venomous. If the red is next to a black stripe, the snake is not venomous. Coral snakes tend to live in soil or within rock burrows, particularly in scrub-covered sand hills. They are shy, but their nocturnal habits can create problems for humans. In case a bite does occur, symptoms can develop as paralysis sets in, with slurring of speech, vision issues, and respiratory failure. Fatality rates are estimated to be as high as 20%, but there is some "good" news: coral snakes are unable to release their venom fully in a single strike and full evenomation requires a chewing-like process and a relatively long bite. It is estimated that 40% of the bites (about 100 per year in North America) to humans contain no, or very little venom. The Western (Micruroides euryxanthus) and Eastern (Micrurus fulvius) coral snakes are pretty similar in many ways. Both have some of the most potent neurotoxic venom in North America, both are brightly colored with primary black and red stripes with smaller yellow encircling stripes, and both species prefer the southern part of North America. The Western coral snake is approximately 24 inches with larger examples exceeding 30 inches. Although rarely seen in daylight, the Western coral snake prefers dry, rocky areas and desert. The Eastern coral snake typically burrows underground during the day and prefers leafy forest areas. Another of the venomous snakes in Texas is the Western cottonmouth or water moccasin (Agkistrodon piscivorus leucostoma). One snake, two names, the cottonmouth is definitely one to avoid, growing to over four or five feet in length. The older it gets, the darker this snake’s coloration will be, graduating from lighter browns to darker blacks over the years. The inside of its mouth has white shading, hence why it is called a cottonmouth. It is usually found near water, in the ditches, canals, swamps, marshes, ponds and lakes of the eastern and central parts of Texas as well as the Gulf coast. The Western cottonmouth is a stubby, muscular snake which can grow up to 72 inches. It is somewhat larger than its cousin, the copperhead. In addition to being larger, the cottonmouth has a slightly more powerful venom, but is still rarely lethal to humans.This snake has very toxic venom, and causes victims to hemorrhage and requires medical intervention. The snake will usually only attack when threatened. These snakes can even bite under water: from swimmers to travelers, everyone in Texas needs to keep an eye out for them. The cottonmouth bite is much more dangerous and harmful to humans than the bite of the closely related copperhead. The cottonmouth is more aggressive, but as with the copperhead, biting isn’t common unless the snake is actually touched. 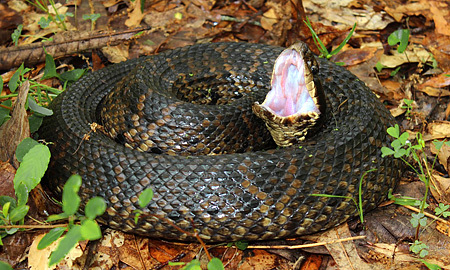 Conversely, the cottonmouth/water moccasin has a more aggressive reputation, but when threatened, will occasionally hiss and almost always assume a strike-ready pose. The biggest difference between the cottonmouth and the copperhead is that cottonmouth snakes are semi-aquatic and are most commonly found in marsh, swamp, and warmer streams and lakes. The cottonmouth is the only semi-aquatic viper in the world. They have been seen in saltwater and have colonized some near offshore islands on the east coast. Actually the third most dangerous rattlesnake in North America, the timber rattlesnake (Crotalus horridus) graces the famous Gadsden flag (don’t tread on me), and certainly has spawned more fear and respect from settlers than any other through the history of the United States! More of a medium-sized snake, the timber rattler is often found in rugged terrain and forests, although during the summer it is not unknown for pregnant females to head to warmer and more open spaces such as rocky ledges. Females tend to seek sunny open areas when preparing to give birth to 10-20 young. They are well known for their love of garter snakes, a common species of non-venomous snake found in Texas. The timber rattler can grow to more than five feet with the largest recorded at a few inches beyond 6 feet. Large specimens can weigh nearly 10 lbs. Typical adults will be near 40 inches. 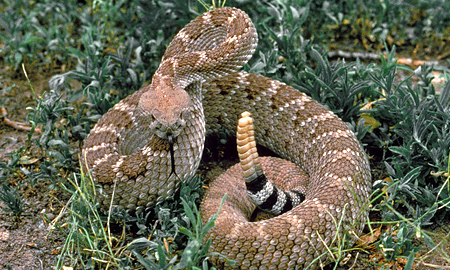 As with all rattlesnakes, the timber rattler can deliver considerable venom in a single, quick bite. 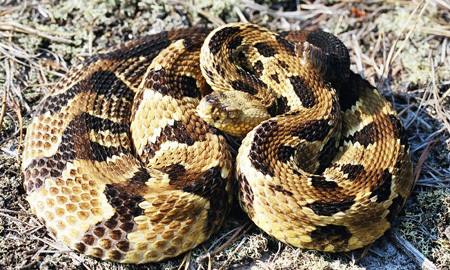 Also typical of the entire genus, toxicity can vary among specimens, for the timber rattlesnake, this is especially pronounced and varies by region. With their large size, extremely long fangs, and the ability to deliver massive doses, a timber rattlesnake bite should be considered life-threatening. Fortunately, the timber rattlesnake is generally hesitant to strike defensively, displaying a long and vigorous posture with a loud rattle. It is mostly an ambush hunter that preys primarily on rabbit, birds, and small rodents, This mottled brown (often nearly black) can be extremely difficult to see.